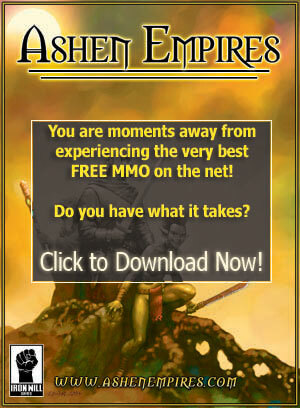 Ashen Empires is an exciting Massively Multiplayer Online Role Playing Game (MMORPG). Players from all over the world cooperate and compete to being order (or chaos) to the lands. The way you choose to play makes a difference in the world around you. Create a character in your image that can play as the vagabond warrior, a powerful mage, a helpful cleric, a crafty potion maker or a resourceful farmer. You can also create your own unique persona from a multitude of different skill combinations. The choice is yours! Best of all, it's FREE*! Download Ashen Empires today and get in on the fun! The Ashen Empires Game Launcher will have you playing in our world as quickly as you can click on the link below. What are you waiting for? *There is no cost to download or play the complete, original Ashen Empires game. In order to unlock advanced content a monthly subscription fee is required.